If you follow me on Instagram, you’ve already seen the big reveal photo. But of course I still have to share it here, because the first costume is a big milestone in the life of any kid raised by a geek, right? Hobbit as a hobbit. Bet you never saw that coming, right? The catalyst was the booties, which my mom knitted and gave us last Christmas. So I decided then that a hobbit lad or lass had to be the first costume. It was a pretty easy costume to put together, minus the struggle of finding hands-free time to do it. I ended up resorting to going to my parents’ house early on several teaching days, and sewing while my mom held him. (Naptime crafting…the struggle is real.) The shirt and vest are the components that I made. 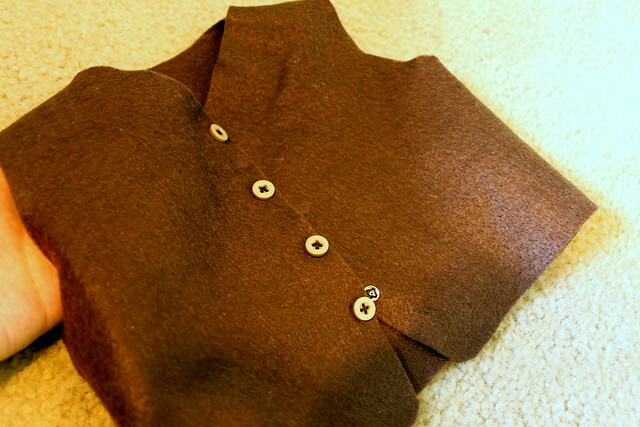 He already had brown knit pants in his current size, so I just folded the hems up to shorten them. I didn’t have patterns for either piece, so I had to trace off some of his clothes and draft my own. I used a button down shirt as the basis for the shirt, but decided that I didn’t want to bother buttoning up a shirt that the front would be mostly hidden on. Hobbit is very squirmy when one tries to dress him now! 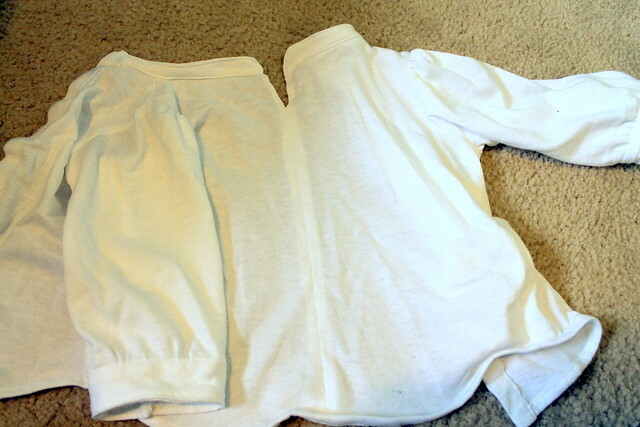 Besides, my fabric source was a white t-shirt in my refashion bin. So I used Velcro in the back to close it up easily, and seamed the front to facilitate the faux button down look. I based the look off of Frodo in the movies, since my little Hobbit’s hair color is closest to his, and his look is less of a choking hazard than Pippin’s scarf. That shirt has a Mandarin-style collar, so I just used the collar stand by itself, finished the edges down to the center front seam to make a sort of v-neck, and left it at that. I altered the sleeves to add some gathering. The cuffs were a tricky decision. I could have finished them more cleanly, but that would require sewing tiny cuffs and sleeves in the round. So I opted for the simpler route and finished them flat. I probably should have sewed the bottom of the cuff seam first and then stitched in the ditch to attach the lining to the sleeve, rather than fold the seam allowance under and topstitch like I did. But I didn’t think of that till halfway through the first one. I blame sleep deprivation. As for the vest, I traced off a fleece zipped one and modified the front. I did have it cut out of a stashed piece of brown fabric that was too little yardage to make anything adult-sized, but ended up ditching that in favor of craft felt, because I was running out of time and felt doesn’t need edge finishing or lining. So four seams + snaps hidden under buttons = done. The bonus is that it looks kind of like wool, without me having to touch it. It burnssss ussss, we hatessssss it, Preciousssssssssss! Goll….ahem. He seemed comfortable enough, and he was definitely cute! I’m already pondering what costume to make him for next year–he’ll probably be old enough to go out, but not old enough to go up to houses alone. Obviously, this means I need to dress up with him, right? Oh, darn. I did try this year– I didn’t have time to sew anything new, so I cobbled together a vaguely Elf-ish outfit out of my olive green Hummingbird skirt (which is snug, but zips up now, yay! ), a funky-sleeved shirt that I made back in college and still love, and my costume cloak that I sewed up years ago. And boots. Always the boots. A quick note about October totals: 4 yards out, plus the t-shirt from the bin, no yards in. I think that leaves me with around 347 left. I will need to buy fabric before the end of the year–all signs point to me needing to make a fourth size of diapers, because he’s already on the largest snap size for the small and so there’s no way medium will last me till he’s potty training age–but I’m in good shape to hit my goal of ending the year with less fabric than I started with. 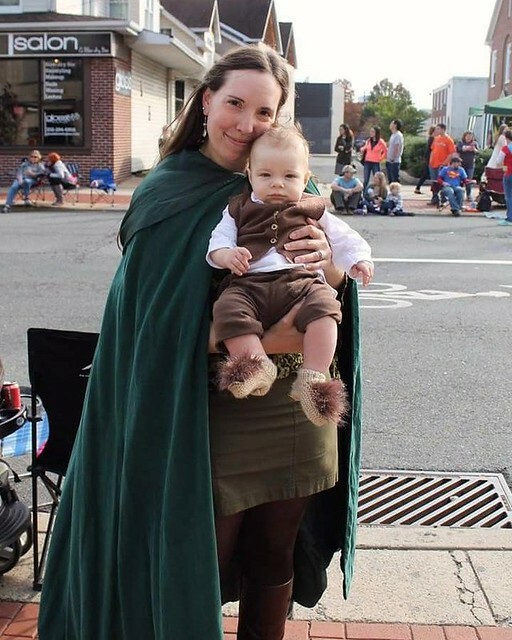 Such a cute costume, love the hobbit booties! Thanks! I’m so happy that they still fit with room to spare, since I’ve been plotting this one for so long. So sweet! The booties are over the top and worthy of a tiny hobbit! So, which Doctor will he be first? Nice! Amy was such a fun companion with an equally good storyline, and bow ties are crazy cute on little guys in addition to being cool. 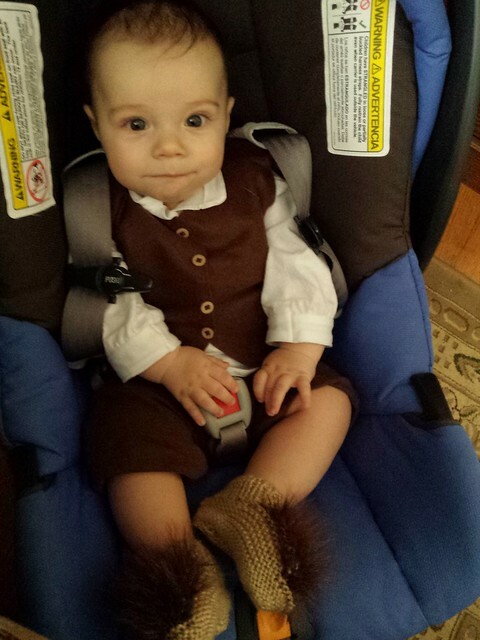 Clever Mom made an adorable baby a hobbit! Cute!